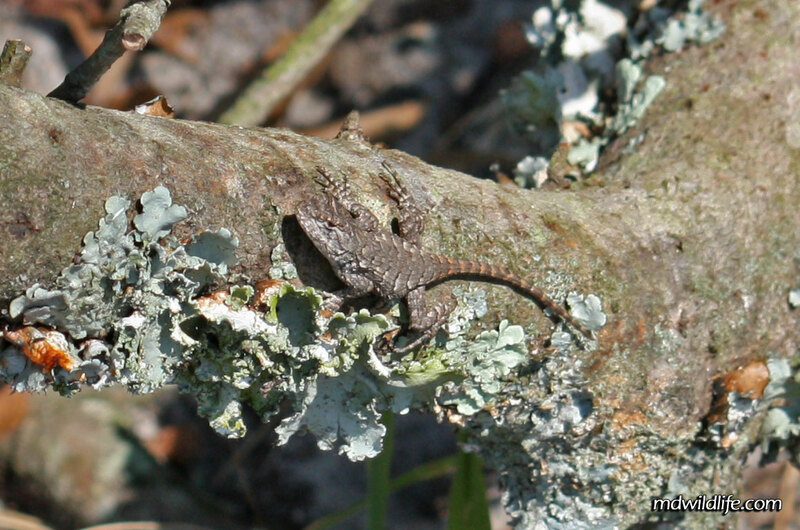 An Eastern Fence Lizard crawls along a log at Idylwild WMA. 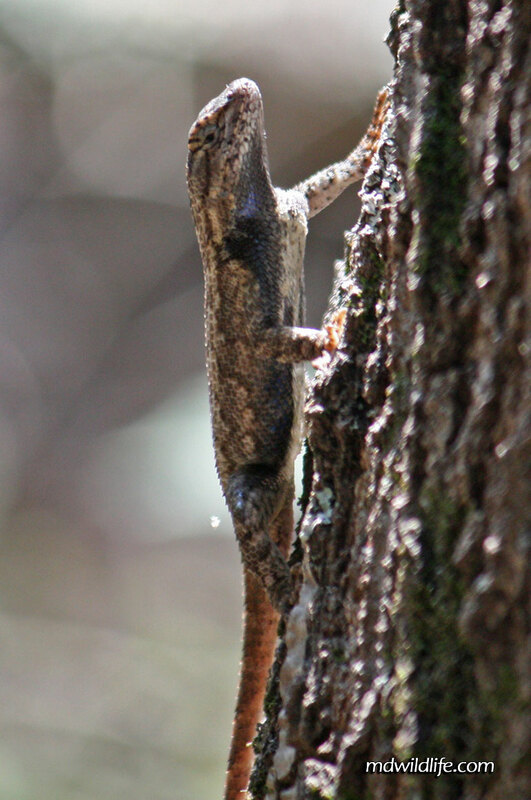 The Eastern Fence Lizard (Sceloporus undulatus) is a medium sized lizard found across the state of Maryland. The gray lizard grows to less than a foot long (about 6 or 7 inches) and can be found across much of the mid-atlantic U.S. states and as far south as Florida. It will usually stick to forest areas where its pattern and coloring can nicely blend into a surrounding of rocks, trees and logs. 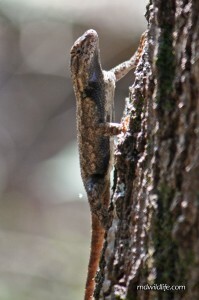 An Eastern Fence Lizard clings to the bark of a tree at Idylwild WMA. I snagged the Lizards in the two pictures on this post during a hike through Idywild Wildlife Management Area in Federalsburg, Maryland. It was a hot day in early September when I took my trip to Idylwild, and on both occasions, I caught a lizard’s movement out of the corner of my eye and then stayed on it as it suddenly froze in an attempt to avoid being seen. The first, I heard scramble through some fallen leaves, and I wasn’t sure what it was, but was pretty sure I saw it cling to the back of a tree. I kind of took a wide path around the tree to sneak up on it, when I saw the Eastern Fence Lizard hanging on to the bark of the tree. It blended in really well and stayed perfectly still. It actually provided a great subject for me and didn’t move for several minutes while I took a few shots. The second lizard I saw on my return trip of the hike. He scurried across the path besides me and jumped onto a fallen log. I turned to look, and, just as the first had done, this lizard clung tight to the log and stayed still in an attempt to blend in to the wood. If you’re lucky enough to catch the first movements, the Eastern Fence Lizard can offer you some great photographic opportunities. The species is found in all parts of Maryland according to some range maps I came across online. Good information can be found here from the friendly folks at Towson Biological Sciences.